And she’s not the only one. She’s joined by the equally amazing Mrs. Who (Mindy Kaling) and Mrs. Whatsit (Reese Witherspoon). Suspense is building for Ava DuVernay’s adaptation of A Wrinkle in Time, with the first trailer coming Saturday. 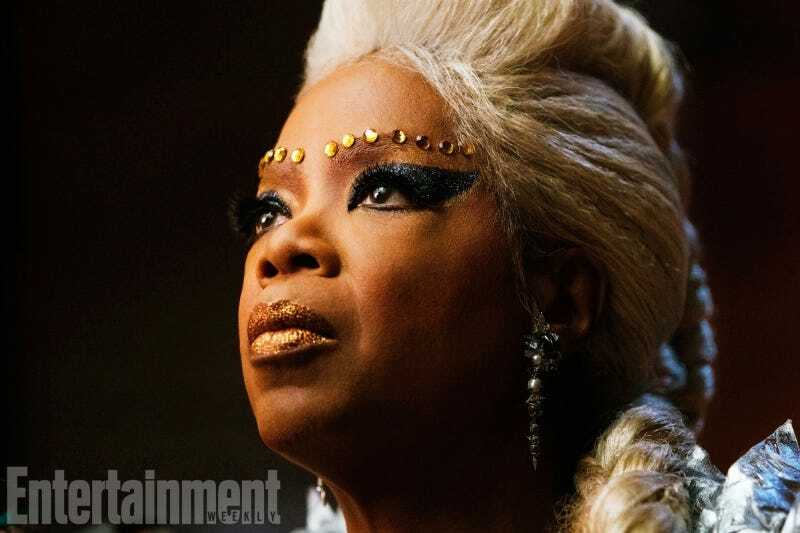 In anticipation of this first look, Entertainment Weekly has unveiled a bunch of photos for the upcoming film... including the first look at our famous celestial ladies. A Wrinkle in Time, written by Madeleine L’Engle, is about a young woman named Meg Murry (newcomer Storm Reid), who travels the cosmos with her genius brother and a male friend in search of her missing father (Chris Pine). She’s guided on her journey by three celestial beings of nearly-infinite age and wisdom: Mrs. Who (Mindy Kaling), Mrs. Whatsit (Reese Witherspoon), and Mrs. Which (Oprah Winfrey). In an interview with EW, DuVernay said she was looking for “a black Mrs., a white Mrs., and a Mrs. that was not either,” making sure they were different body types and ages, in order to better portray the wide gamut of femininity. Witherspoon, who’s actually three years older than Kaling, plays the youngest and most innocent Mrs. of the group. And when it came to picking the actress for Mrs. Which, DuVernay said there was no question it would be Winfrey. Entertainment Weekly shared some other photos from the upcoming film, including our first look at Pine as Mr. Murry trapped on Camazotz (he’s got a beard, because all male scientists have beards!). A Wrinkle in Time is set to come out March 9, 2018. You can find the rest of EW’s photos here.